Scientists have identified an enzyme that is crucial for turning breast tissue into tumours, according to a study published in the journal Cell. The Institute of Cancer Research says blocking the enzyme lysyl oxidase (LOX) reduced the size and frequency of tumours in mice. They say LOX stiffens collagen, a major component of the supportive tissue in the breast. A cancer charity said the study added to knowledge about how tumours develop. The supportive tissue surrounding cancer cells is shaped differently to healthy tissue as well as being stiffer and more fibrous. 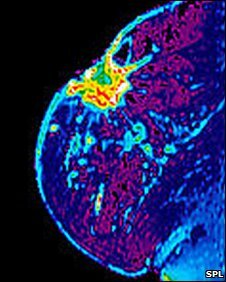 These properties have helped doctors to detect breast cancers, but until now scientists have not known what was causing these changes. The team at the Institute for Cancer Research, using mice, found that LOX caused the collagen to change in a process known as cross-linking, which makes the tissue more fibrous. Higher levels of LOX increased the levels of collagen in mammary glands, made the tissue stiffer and correlated with a higher number of tumours invading the breast tissue. When the team used chemicals or an antibody to block the enzyme, they found collagen in the mammary glands contained fewer cross-links and was less fibrous. The tissue also contained fewer, smaller tumours and they were less aggressive. Professor Valerie Weaver of the University of California in San Francisco, who led the team, said: "This study may also help explain why the rate of breast cancer increases dramatically with age - aged tissues are stiffer and contain higher levels of abnormal collagen cross-links. "I'm cautiously optimistic. We still have a lot more work to do, but this is certainly exciting." Dr Janine Erler from the Institute of Cancer Research, said the study showed that stiffening of the breast tissue controlled by enzymes such as LOX was a key factor in cancer development. These enzymes could be a promising candidate drug target, she added. Dr Alexis Willett, head of policy at Breakthrough Breast Cancer, said: "This early stage research in cells and mice increases our understanding of how breast cancers develop and grow and suggests that enzymes such as LOX could be a potential target in the treatment of breast cancer. "The next stage will be to test whether LOX has the same effect in humans, but it is likely to be some time before any potential new treatment is developed."